In the early days of the FIDE Presidential campaign Sergei Shipov came to Ilyumzhinov’s defence on his forum when someone said that however bad Karpov is he couldn’t be worse than Kirsan. It seems that it’s taken for granted that things can’t get any worse? How can it get worse? Here’s how – when no money or organisers can be found for running those official tournaments which are run nowadays. That which exists is taken as a norm – as something that by definition will always exist. And only after losing it do you understand that there was something to lose… You remember that there was one universal complaint against Ilumzhinov – that he couldn’t produce a single world champion. Now there is one. You remember that before Ilyumzhinov there weren’t mass tournaments like the World Cup, where decent money can be earned not only by top players but also by normal grandmasters and even masters. Now – they exist. Do you think they’ll be run of their own accord? Unlikely. 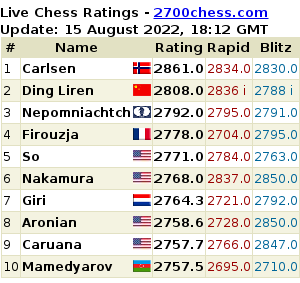 And how exactly is Karpov an improvement on Ilyumzhinov? He’s a stronger player? No arguments. And what else?